Today’s economy is global, interdependent, and complex. Nowhere is this more apparent than at the intersection of the economy and the environment. Environmental stewardship goes hand-in-hand with economic competitiveness. Using resources efficiently — from extraction to consumption — is no longer a simple matter of local decisions; it is increasingly a case of global standards. Canada is already affected by this development and will be increasingly affected in the future. As a trading nation, and a resource-rich country intent on exporting commodities, our economic welfare depends on open access to foreign markets and mutually-recognized international rules for trade and investment. With environmental concerns becoming an increasing determinant of the terms of trade, we need to build up our capacity and step up our expertise in integrating the environment and the economy in business and government decisionmaking — that means embracing Life Cycle Approaches to sustainable development. Life Cycle Approaches are analytical tools geared to support enhanced economic decision-making through a fuller accounting of associated environmental costs. They provide practitioners with much-needed tools that could play a critical role in elevating Canada as a global leader in sustainable development practices. 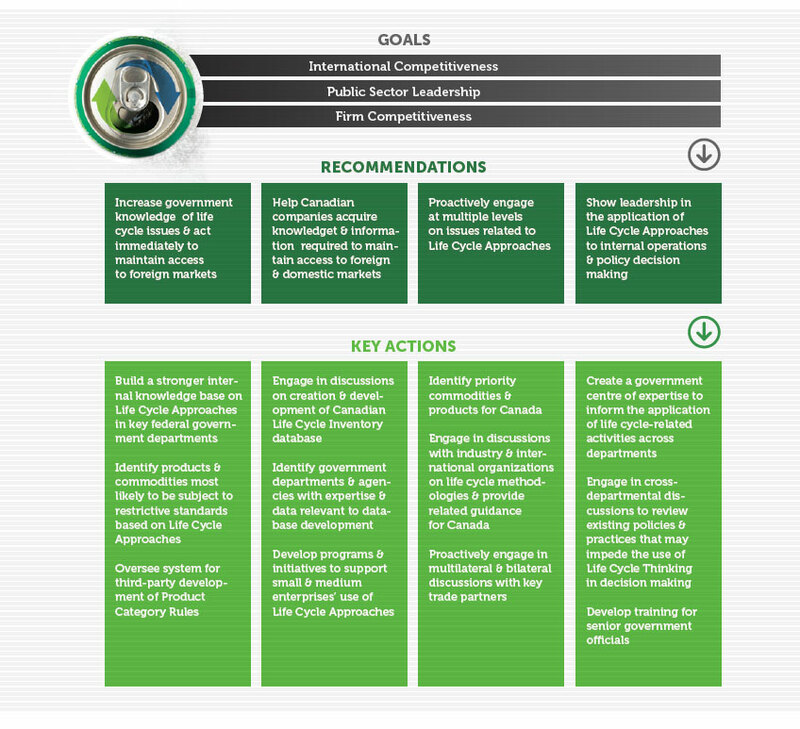 Governments, companies, and organizations across the world are using Life Cycle Approaches to address current and emerging global economic and environmental issues. Canada used to be a leader in the development of Life Cycle Approaches and now needs to keep pace with the global trend. The increased importance of Life Cycle Approaches — domestically, regionally and internationally — has real implications for both Canada’s private and public sectors. This report elaborates on the need for a systemic policy response from the federal government to meet this emerging reality and better prepare Canadian businesses to engage with it. It provides a tour d’horizon of Life Cycle Approach terms and trends, shows where business and government can gain from its application, and offers key priorities for action to move us forward. In preparing the report, the National Round Table on the Environment and the Economy (NRT) brought business leaders and experts together. We engaged officials across federal government departments. We sought international perspectives on life cycle developments. We commissioned original research on what this means to Canada’s private and public sectors. Finally, we distilled this into what Canada can and should do practically to both respond and lead in this area. Advising what role the GoC should play in facilitating successful implementation of Life Cycle Approaches and designing public policy response(s). Globally, Europe is leading the way in the adoption of Life Cycle Approaches within both the public and private sectors. Regionally, the United States, Canada’s neighbour and biggest trading partner, has seen increased adoption of Life Cycle Approaches in recent years. Domestically, the private sector is leading the way in Canada with respect to Life Cycle Approaches. The public and private sectors in Canada need to adopt Life Cycle Approaches to ensure better integration of environmental and economic goals. However, efforts in Canada related to Life Cycle Approaches are fragmented and lack an overall vision or framework to guide their application in a consistent manner. We need a common understanding of Life Cycle Approaches to move the conversation forward and, provide an accurate assessment of their strengths and limitations. The NRT has developed a framework for Life Cycle Approaches that categorizes them into four groups: concepts, programs, tools, and data and information. This framework provides a common understanding of the basis on which the GoC and others can base future dialogues about Life Cycle Approaches in Canada. The Canadian public and private sectors are exposed to clear economic and environmental risks and opportunities related to Life Cycle Approaches. Our analysis delineated three goals that could be better achieved through the application of Life Cycle Approaches: (1) international competitiveness, (2) public sector leadership, and, (3) firm competitiveness. Our report presents a contemporary analysis complemented by case studies to illustrate and substantiate these key risks and opportunities — within both the private and public sectors. A continued passive attitude towards the adoption of Life Cycle Approaches creates risks that can have only detrimental impacts on Canada’s economic competitiveness. These will manifest themselves through non-tariff trade barriers imposed by foreign countries and restricted market access because of private sector supply-chain requirements — Canadian exports of commodities and manufactured goods will be affected. On the other hand, economic gains can result from adopting Life Cycle Approaches. These gains include better supply-chain performance, internal operation efficiencies, and increased institutional capacity that further enhance innovation. As Life Cycle Approaches also support environmental stewardship — by compelling firms to increase efficiencies in their production processes and internal operations, and consider environmental factors in their decision making — reduced environmental impacts will accrue across a multitude of attributes including air, water, toxics and waste. CANADA NEEDS TO DEVELOP CAPACITY AND EXPERTISE IN LIFE CYCLE APROACHES. A collaborative knowledge-sharing model should be created to provide an opportunity for practitioners from the private and public sectors to share knowledge and expertise with each other. In the public sector, training and guidance should be provided to people implementing Life Cycle Approaches (e.g., asset management, Regulatory Impact Analysis Statements, and Strategic Environmental Assessments) and senior decision makers. In the private sector, support needs to be given to small and medium enterprises (SMEs) that lack the capacity, expertise, and, in most cases, awareness of Life Cycle Approaches. A Canadian Life Cycle Inventory Database should be created to provide access to important information for both the private and public sectors. The database would allow the private sector to respond to trade and market access requirements related to Life Cycle Approaches. The database would support the integration of Life Cycle Approaches into government internal operations and decision making. Canada should be involved in multilateral efforts to create standards for potential trade-restricting measures such as product footprint standards and eco-labels. The GoC should support and oversee the development of robust Product Category Rules (PCRs) by third parties. The GoC should participate in the management of a uniform labelling program or Environmental Product Declarations (EPDs) for multiple environmental attributes for a product or class of products that meets a designated standard. The GoC should functionally integrate its acquisition, maintenance, and disposal functions by developing budgeting and management practices that are more conducive to Life Cycle Approaches. The GoC should use performance information to conduct benchmarking and then build and bolster the business case for green procurement and for asset management based on Life Cycle Approaches in general. The government’s response needs to focus on key life cycle issues and be staged over time. Short-term responses will counter immediate risks to international competitiveness in the areas of trade and market access. Longerterm responses will foster enhanced economic efficiencies and related environmental benefits of Life Cycle Approaches by increasing their adoption in the public and private sectors. In government, this includes increasing efficiencies in internal operations and integrating Life Cycle Approaches when making decisions about new policies. Increased efficiencies in internal operations and throughout the supply chain should be targeted in the private sector. Develop initiatives aimed at supporting SMEs that want to get involved in Life Cycle Approaches but lack the capacity and expertise. CANADA NEEDS TO PROACTIVELY ENGAGE AT MULTIPLE LEVELS ON LIFE CYCLE-RELATED ISSUES. Proactively engage in multilateral and bilateral discussions with key trade partners, particularly the United States and the European Union. This will reduce the risks of having Canadian goods and commodities subject to standards established by foreign interests that are not consistent with our own. The aim is to first, ensure Canadian economic interests are not penalized by foreign rules and regulations targeting or side-swiping our commodities and goods, and second to build a trading framework based on mutually-recognized life cycle science, data, and information. The GoC response to the above mentioned areas should be a concerted response with the private sector and involve other stakeholders such as nongovernmental organization and academics. The NRT recommends that the GoC establish a Life Cycle Approaches Task Force, which would address issues of direct and indirect relevance to the government. Direct issues include capacity building and coordination of Life Cycle Approaches related to GoC internal operations and decision making, while indirect issues mainly include liaison with and support to the private sector. It is recommended that the Task Force be established as a temporary measure, for a period of 24 to 36 months. The Task Force would liaise with and get advice from a multi-stakeholder External Advisory Panel that would oversee three Working Groups mandated to create and develop future partnership models as needed to develop a LCI database, standards, and SME capacity building.